For over 30 years, the Kaiser family ran a successful sheet metal shop in DeKalb, IL. (I wrote about the later years of this shop in this earlier post!) Andrew Kaiser and his two youngest sons operated the shop, but the family’s history in tinsmithing didn’t start in DeKalb. The patriarch of the family, Andrew Kaiser, had been a tinner and metal worker for nearly his whole life, and his career lasted for over 50 years. His long career even includes some exciting surprises! Andrew J. Kaiser (1842-1923) was born in Germany on 17 April 1842, and his family immigrated to the United States in May 1851. The family settled near Wilkes-Barre, Pennsylvania. His father Andreas died a few short years after their arrival in the United States, so very quickly the burden fell on Andrew and his siblings to care for the family. Andrew was 14 years old when his father died, and likely started looking for work about that time. Tinsmithing became the trade of the family. It is unclear whether past generations of the family were tinsmiths or metal workers. However, all three living Kaiser brothers learned the trade after the death of their father. Andrew likely learned the tinning trade as a young man in Pennsylvania with two of his brothers, who also made a career out of tinsmithing. Andrew’s older brother William was a tinsmith and plumber in Wilkes-Barre, PA, and established his business in 1868, shortly after returning from serving in the Civil War. By 1900, it seems that he expanded to include hardware and lumber. His obituary names him as the “Senior member of well-known plumbing contract firm” of William Kaiser & Son (Wilkes-Barre Evening News, 10 Nov 1914). His career lasted over 45 years. Their youngest brother, John Phillip Kaiser, was also a tinsmith in Wilkes-Barre as a young man, and moved to Philadelphia in the early 1870’s, where he continued the trade for at least 35 years. While William and John Phillip grew their own tinsmithing careers in Pennsylvania, Andrew decided to try his luck out west. In 1865, Andrew married Elizabeth Wentsel in Scranton, Pennsylvania, and shortly afterward, left for the Midwestern frontier. Andrew worked as a tinner for a brief time in Denison, Crawford County, Iowa, around 1870. Within a couple of years, the family moved to Prophetstown, Whiteside County, Illinois. In Prophetstown, Andrew worked as a tinner for several years, probably at one of the hardware stores in town. In 1881, he began a new job at the McMillen & Wylie hardware store in nearby Tampico. A newspaper clipping says “Mr. A. Kerser, who has been at work for the past eight years or so at Prophetstown, is the man. He is a practical tinner and a good workman besides being a fine salesman. He is a hardworking industrious man and we are glad he has secured so good a situation. He has rented the house, lately fitted up by Mr. O. Bonker, and will move his family here as soon as the house is in readiness for him.” (Tampico Tornado, 23 April 1881) He was not afraid of hard work, or moving his family to secure better opportunities for his future! I was very surprised to learn that in addition to being a skilled tinsmith, Andrew gained a reputation as an inventor! 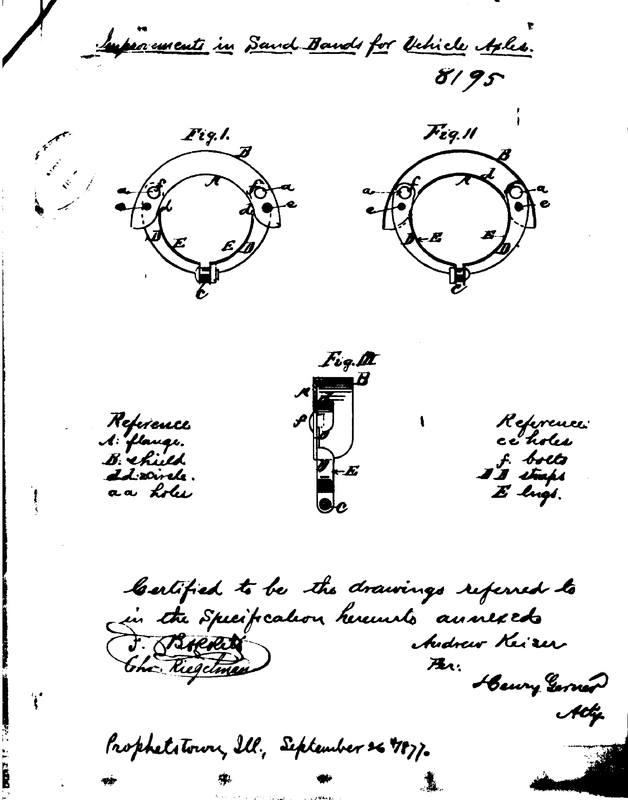 With the help of Henry R. Kent (who was a merchant in Prophetstown at that time), Andrew invented a device called a “Detachable Sand Band.” According to a newspaper clipping at the time, this device “is attached to axles of wagons. It will keep all sand and dirt from getting inside the hub and wearing out the skeins of wagons” (Tampico Tornado, 2 Feb 1877). It was patented in Canada under patent CA8195A in 1877. Although the newspaper article says that the men were about to commence manufacturing on the product, it is unknown whether this device was actually manufactured at that time. The patent may have allowed him to secure a better job in Tampico, and eventually allowed him to open his own business in DeKalb. Another surprise! Andrew wasn’t the only inventor in his family! Back in Pennsylvania, his brother William also invented the Kaiser hydrant, for which he held several patents, starting in 1877, and another hydrant and hydrant-valve in 1883 (click on links to see original patents). According to his obituary, the hydrant “found a ready market and is in use throughout the country” (Wilkes-Barre Evening News, 10 Nov 1914). I wonder if there was a little sibling competition between the two brothers? In 1885, Andrew married Jennie Holbrook (1859-1922), each of them bringing multiple children from previous marriages. (Read more about their large family here.) The growing family moved to DeKalb in about 1891, and their four youngest children were born there. Andrew brought his tinning skills with him from Tampico. He established his own business at 622 E. Lincoln Highway in DeKalb. He was one of three tinners in DeKalb at that time. In the earlier years, he specialized in stoves, eaves, spouting, and other light metalwork. For many years, he operated a shop at this location and was an important part of the East End Business Section of Lincoln Highway. 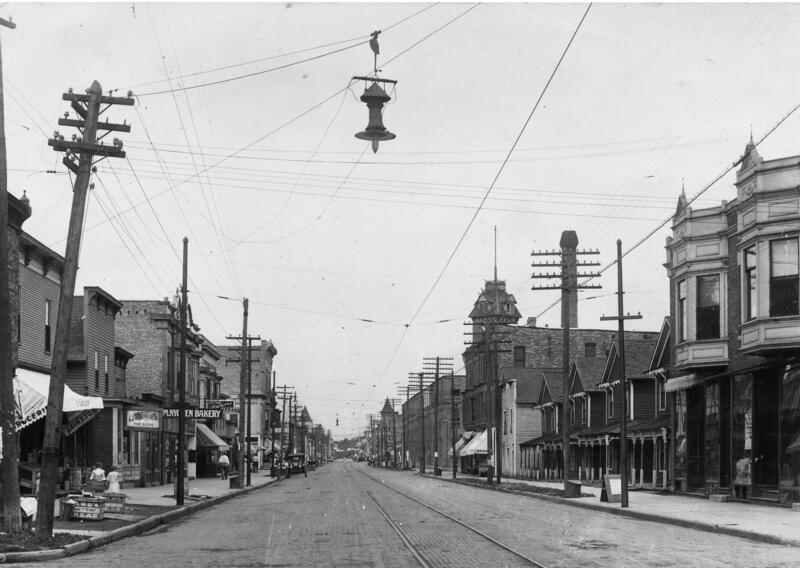 At that time, the 600-700 blocks were the far east end of Lincoln Highway, and there were few businesses that were further east. Today, the location of Andrew’s shop is now the location of the DeKalb Post Office. Andrew didn’t stop tinkering and inventing when he got to DeKalb. In 1913 and 1914, he applied for two more patents. 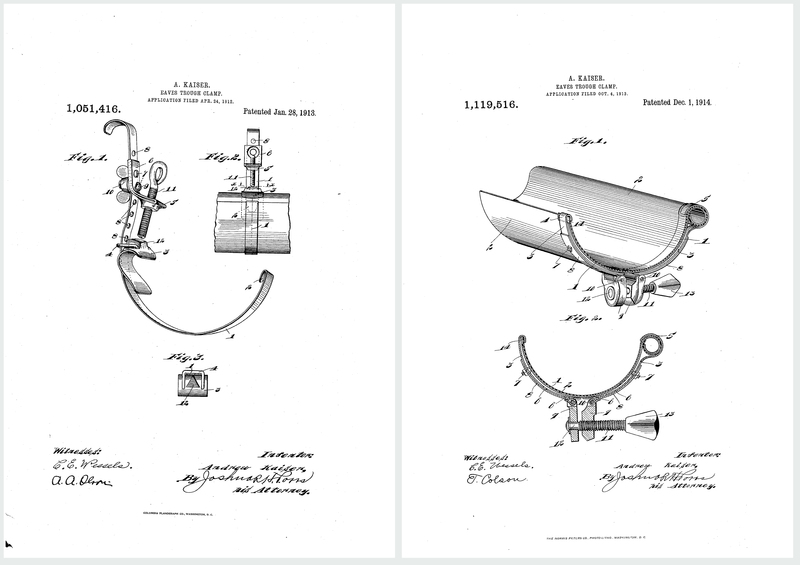 This time, he was working on “Eaves-Trough Clamps.” (See the original patents here: 1913 Clamps, and 1914 Clamps.) Part of his business in DeKalb included making and installing eaves. These two kinds of clamps are designed to hold the eaves troughs while the pieces are soldered together. These clamps were probably once used on many of the eaves on the houses of DeKalb! Andrew had a gift of perseverance, entrepreneurship, and skillful metalworking that he passed down to his sons. Although the tinning shop itself eventually closed, Andrew’s hard work and ingenuity was a lasting legacy in his family for many generations. “A. Kaiser,” The Daily Chronicle, DeKalb, Ill., 16 Mar 1921, image copy (www.newspapers.com : accessed 13 Aug 2018), page 14; Newspapers.com World Collection. “Announcement,” The Daily Chronicle, DeKalb, Ill., 25 Oct 1923, image copy (www.newspapers.com : accessed 25 Aug 2018), page 5; Newspapers.com World Collection. “William Kaiser, A Civil War Veteran, Dead,” Wilkes-Barre Evening News, Wilkes-Barre, Penn., 10 Nov 1914, image copy (www.newspapers.com : accessed 25 Aug 2018), page 1; Newspapers.com World Collection. “Locals,” Tampico Tornado, Tampico, Ill., 23 Apr 1881, image copy (http://idnc.library.illinois.edu/ : accessed 3 Dec 2018), page 1; Illinois Digital Newspaper Collections. “East Lincoln Highway (1912),” scan of original photograph; Ritzman Photo Collection, NIU Digital Archives, Northern Illinois University, DeKalb, Illinois. “Main St. Tampico, Ill. 1900,” scan of original postcard; Cragin Spring, Flickr.com. Mildred (Kaiser) Drake, daughter of Glenn Kaiser, (Kingston, Illinois), interview by Eva Weil, 2000; notes of the interview privately held by interviewer, Kingston, Illinois, 2018. Kaiser family photos and documents, originals; Kaiser Family papers, privately held by E. Weil, Kingston, Ill.
Tampico postcard, original; Illinois Postcard Collection, privately owned by E.D.J., Kingston, Ill. Patents US192336 (Jun 1877), US278435 (May 1883), US284021 (Aug 1883), US1051416 (Jan 1913) and US1119516A (Dec 1914) from Google Patents; accessed 5 Feb 2019. Patent CA8195A from Espacenet (https://worldwide.espacenet.com/publicationDetails/biblio?FT=D&date=18771210&DB=&locale=en_EP&CC=CA&NR=8195A&KC=A&ND=5); accessed 5 Feb 2019. I enjoyed reading about Glenn and Floyd’s industrious and inventive dad. The first photo has really good detail when magnified. Where did you find it? Thanks! It was in the digital archive of a local history center. Link to the archives is in the sources! It’s a wonderful local resource! As soon as I hit Post, I realized that you’d cited it. Oops.